This fun rocket looks like a real wooden pencil! It "sky writes" up to 1100 ft. (335 m) in the air. The No. 2 Estes Sky Writer, an E2X kit, comes with colored body tubes, fins and nose cone. 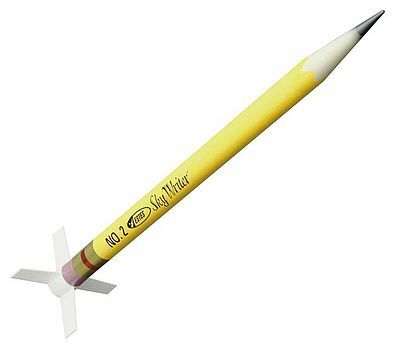 This almost ready to fly model rocket offers quick and easy assembly. Retail $14.99 SAVE 23% ! I bought several of these kits over the years because the nose cone can be used to clone a number of different Estes products like the Black Brant III and the Stiletto. One night before a launch I was in the mood to build something different to fly the next day, and found an unopened Skywriter in one of my storage bins. The build was simple, as E2X builds tend to be, but the finished product was much better looking than I&apos;d anticipated. No painting, which is hard to complain about. I swapped out the tri-fold shock cord mount for a length of Kevlar and a longer piece of sewing elastic, but other than that, it was built as it came out of the bag. It was lost on the first flight to an impressive B6-4 CATO, but I was impressed enough to build another one to replace it. This has the makings of a great small field bird and at this price, they&apos;re easily replaced. Flights up to 1100 feet. Detailed illustrated assembly and launching instructions. Great rocket! Goes together easy and quick, and on a C engine, really takes off! I painted mine solid red to get away from the pencil theme, and this rocket is popular at the flying field, mainly for its performance. It shoots right off of the pad, and with a smaller parachute, does not carry too far. Getting away from sanding sealer and a fin alignment guide during construction doesn&apos;t hurt, either.